Restarting your server can solve many problems you might be experiencing. However, because your server may be performing functions outside of Execu/Tech software, you should consult your IT professional about the proper shutdown and restart procedures. Sometimes computers and devices must be reset in a certain order, other computers or devices must prepare or applications must be stopped. One example is that all instances of Execu/Tech software running on the client terminals should be stopped before restarting your server. Many things can cause Execu/Suite software to become slow, stuck, unresponsive, hang, crash, etc. This document will discuss the most common reasons and possible solutions. The Not Responding message is a common symptom of network communication problems. The network speed between the client and the server may be slow at the moment, there may be packet loss, the server may be having issues itself that could be slowing down data access, etc. If you are seeing this message often, you might try rebooting the server and client computers to see if this helps. However, you shouldn't be alarmed if this message appears for a moment then goes away or if it appears when the program is 'crunching numbers' or looking for printers to display. Please Wait or a flashing 99 is another message you might see. Typically, this happens when read and write operations are taking a very long time. As the slow or stuck terminal is reading or writing, other terminals may see these messages. If the message flashes then vanishes quickly, don't be concerned. The following items are things you can check and may help you solve the problem or get you pointed in the right direction. These are reasons you may be experiencing a problem and also some possible solutions. Execu/Suite Updates. We are constantly streamlining code, fixing bugs and attempting to improve performance of our software. It's possible that the performance issue you are experiencing has been addressed and fixed in a newer version of our software. For customers with a 24 hour support contract, updates are typically free, and even customers on limited support contracts get steep discounts for updates. All customers have a 1 year update warranty from the date of purchase, so all updates are free for the first year, regardless of the support contract status. The RPC Server service handles communication between the clients and server and without it you may not be able to share files or printers. Execu/Tech Systems Can't offer you any assistance with errors like this. Please contact your IT Professional for assistance. Register Programs and Controls. It's possible you've added a new terminal or you've never run this in the past. There are some situations where a registry entry must be made to modify the file access method used by the runtime. This utility will create this registry entry. Click here for instructions . Other applications running. Make sure a backup, antivirus scan or any other disk or processor intensive application isn't running at the same time. Inadequate hardware. If your server, client or network hardware is old then it might not have the power to handle modern software. As our software is updated, we take advantage of modern advances in computers and networking, like more processing power, more RAM and faster networking speeds. If your hardware doesn't meet our minimum requirements or is slow in everything it does, you may consider upgrading. Failing Hardware. It's possible that some piece of hardware from the client to the network to the server is having a problem or is incompatible with newly installed hardware. Nothing lasts forever and hardware will fail. If things were running smoothly and suddenly you begin experiencing errors, it's likely some piece of hardware is failing. In our experience, it's typically a single computer with a problem, but it causes problems for every computer because it locks files and can even corrupt files by injecting garbage into the database. A good IT specialist will be able to look at your hardware and software and determine what might be failing. Each computer has an Event Log with valuable information concerning hardware and software failures. Power Supply. A failing power supply can cause individual components in the computer to fail intermittently. It can also cause unexpected reboots, network disconnects, etc. RAM. While RAM failures are uncommon, they happen. If you suddenly begin seeing "Memory Access Violation" you may have failing RAM, although this can also be caused by running multiple applications at once and one or more of the applications fails to properly notify the operating system of it's RAM needs. Hard Drive. This is most serious at the server. It can cause data to be lost or corrupted. Most hard drives are able to notify you when some problems are detected. Network Card. This is what connects you to the network and allows the clients and server to communicate. A single failing network card can corrupt data and cause the Execu/Suite software on every other computer to lock up. Windows Updates. Microsoft releases updates to fix issues with the Windows operating system. Many of these address hardware and network speed and reliability. It's important to keep your operating system up to date with the latest patches and updates. Driver Updates. Your computer's hardware (network card, chipset, video card, etc.) may need a driver update. These updates are often included in Windows Updates, but sometimes you have to obtain them from the hardware manufacturer. These driver updates address speed and stability issues and can often solve performance issues with not only Execu/Suite software, but other software you might be using. Power Plan and Power Management. 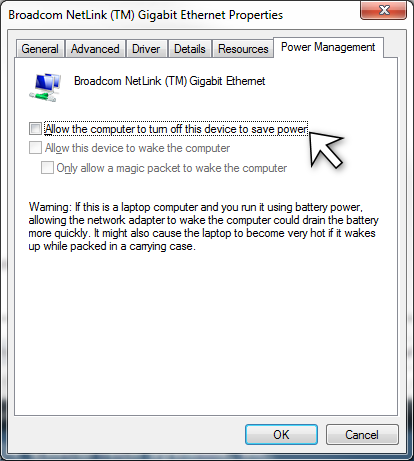 In a business environment where the terminals need to maintain a steady connection to the server, it's important that a power plan be implemented that DOES NOT turn off the LAN or WAN device. If this happens, the software could hang because the connection to the server is no longer available. This could also cause problems with Remote Desktop connections dropping when the terminal isn't in use. You must also be sure that the device's own Power Management settings don't allow this to happen. We provide a benchmark utility to help determine if your network might be the cause of some of the problems you're experiencing.